A chicken’s crop is located immediately beneath the neck, against the breast, and just right of centre. When a chicken has eaten the crop extends to accommodate the food and can be clearly seen as a ‘swelling’ when it is full. 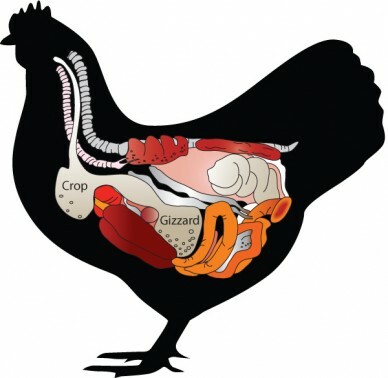 Food is stored and partially digested by enzymes in the crop throughout the day, before being released for further digestion in the gizzard as and when required. 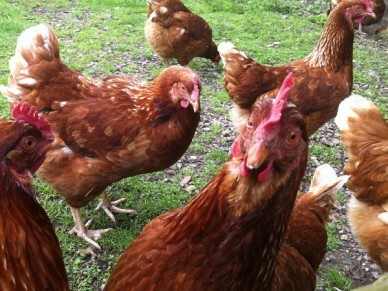 There are two main crop problems that chickens will suffer from – impacted crop and sour crop. Some chickens, especially large hybrids, because of their huge appetite, can get an impacted crop; this is usually due to a blockage caused by too much food, or stringy grass, but can also just be due to a loss of tone in the muscles around the crop. Normally a chicken’s crop should be full at bed time and empty in the morning. If the crop is still full in the morning and feels firm or hard to the touch it is blocked and you will need take action to clear it. Having detected that a chicken has an impacted crop greatly restrict the amount of food intake and be sure to keep the chicken hydrated. 1. Syringe some warmed olive oil into the side of the beak and massage the crop gently to attempt to loosen the blockage. Do this three or four times a day. If successful the blockage will have been loosened enough to be digested in the normal way. 2. Feed the chicken with white maggots. They will munch their way through whatever is causing the blockage. You must use white maggots or pinkies. The dye in the coloured maggots is toxic to chickens. Pinkies are simply small maggots that are pink when young but turn white as they mature and are safe to feed to poultry. Once resolved it is important to stop it happening again – a previously impacted crop will be less elastic and therefore more prone to over-filling in the future. 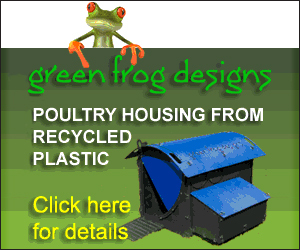 Remove any stringy grass or weeds from the area your chickens graze in. Do not feed bread (this is true for any of your chickens) and try to limit the amount they eat to only what is necessary. You should always ensure there is enough grit available to your hens to aid digestion. If this treatment has not been effective after three or four days the contents of the crop will become sour owing to a fungal infection caused by the fermentation of the crop contents. A recurring problem of crop impaction can be treated by a vet who will empty the crop by means of surgery. This has a reasonable success rate but can be expensive and the use of anaesthetic is high risk for chickens. Sour crop can be identified if the crop has not emptied and is soft and squidgy when you feel it. On opening the chicken’s beak you will be greeted with a foul smell caused by the fermenting contents. There will be a fair amount of fluid in the crop which will need to be evacuated. To do this hold the chicken upside down with the head away from you and gently massage the crop from the bottom to the top so that the fluid can drain from the crop. Do this slowly, in short spurts of few seconds, allowing fluid to drain out, then lift the chicken upright again slowly. Give the chicken time to get its breath back (a chicken cannot breathe properly upside down and there is unnatural pressure on its internal organs) then repeat the process. When no more fluid drains from the crop allow the chicken time to calm itself and offer a small amount of food and water. A little live pro biotic yoghurt can also be given to help combat bacteria still in the crop although unless the blockage has fully cleared it is unlikely to be effective. Apple cider vinegar and garlic added to drinking water or treats also acts as a good anti-bacterial after draining and can be introduced as part of your chickens’ regular health routine. Give small amounts of food and ensure the chicken remains hydrated. Continue emptying the crop of fluid for at least three days or until no more fluid drains out, whichever is the soonest. Continue giving live pro biotic yoghurt until the crop no longer remains full and returns to normal. Both of these conditions can be fatal due to choking therefore, in the event that the problem persists for more than a week, seek a vet’s advice as a course of anti-fungal medicine may be required. Our hen definitely has sour crop, I tried the upside down massage technique and nothing happened. I was fairly gentle with the crop, should i press a bit harder? Some lubricating oil such as olive oil etc can be given, massage the crop gently again to see if anything shifts. If it doesn’t clear or your hen seem in distress then I suggest a visit to a poultry friendly vet who can usually clear the crop with a long tweezer type implement, or if that is not successful a small incision will be made on the outside of the crop and the vet will remove whatever has collected in there. Not all vets anaesthatise the hens, some just sedate them, and its normally a fairly quick operation. This could just be its natural shape. Unless, this is recent development and you see any sign of distress or a change in its normal characteristics I would say it was nothing to worry about. However, it is difficult to tell without seeing or feeling the birds and I am no specialist so if you are concerned a trip to a poultry friendly vet may be in order. HI , my hen Chloe is having some crop issues. It started off with what i think was an impacted crop. I game her water and messaged the crop to help loosen everything up. It did work, the next morning her crop was smaller so I continued giving her water and no food. Unfortunately her crop hasn’t gotten any smaller since. I gave her some olive oil hoping that would do the trick but it hasn’t helped. So i decided to empty her crop myself, I’ve tried several times but nothing comes up. It seams like I’ve been close a few times but she keeps swallowing it back down. Her crop feels squishy and like something is in there. She hasn’t had food in 2 days only water. Do you have any advice as to how i should proceed and how i could empty her crop. Hi, I don’t want to sound over dramatic but I know from experience that this kind of thing can turn nasty quite quickly so if it’s not evacuating easily using the oil and massage method I would get her to a chicken friendly vet as soon as you can. I have taken my rooster to the local vet here. She saw him and said she would get back to me and never did… Now I have a hen with crop issues and no one I can take her to. She is in the baby pen under warm lights. I am feeding vinegar water and olive oil 4 times daily, no food. She hasn’t eaten in days. Crop was hard. Now it is soft but hasn’t reduced much in size. Is there anything else I can do for her. The vets locally are useless. She is responsive and doesn’t seem to be in distress? Hi It sounds like you may have eased a impacted crop issue with the olive oil however if it doesn’t clear through quite quickly it could turn sour. If her breath smells bad (or it still has reduced in size) you need to clear the crop as quickly as possible using the method described in the article. It can be a pretty horrible experience for both you and the chicken but I have tried it and it does work if you catch it in time. Plenty of water afterwards will also help. Impacted crop can just happen but if your chickens have access to lots of long grass or large leaf foliage that could be causing the impaction it would be best to restrict this if possible. Thank you for the information. Where might I be able to obtain the white maggots? I have a 5 year old hen who appears to have sour crop. No nasty smell from the mouth or discharge and only a small squidgy ball about ping pong ball size. She hasn’t eaten since Sundays morning and after reading various articles I started giving her a very weak apple cider vinegar/water mix this morning. Kept her in her house with acv water mix. I’ve gone down every few hours to syringe feed her more of the mix to make sure she’s hydrated. Is this the right thing to do and how long before I should notice any change. She’s very lethargic and sleepy. MY hen Phoenix came out of the coop this morning with a filled crop which felt a little squishy like a balloon. I felt her crop and there was bubbling noises inside, confusing me. As I massaged her crop, some brownish liquid came out of her mouth. Other than that, she seems to drink a lot and eat a little food. She Ate more pellets in the morning than the evening. I really need some help as I’m unsure if she has sour crop or an impacted crop. She doesn’t have a foul smell but I’m still unsure.